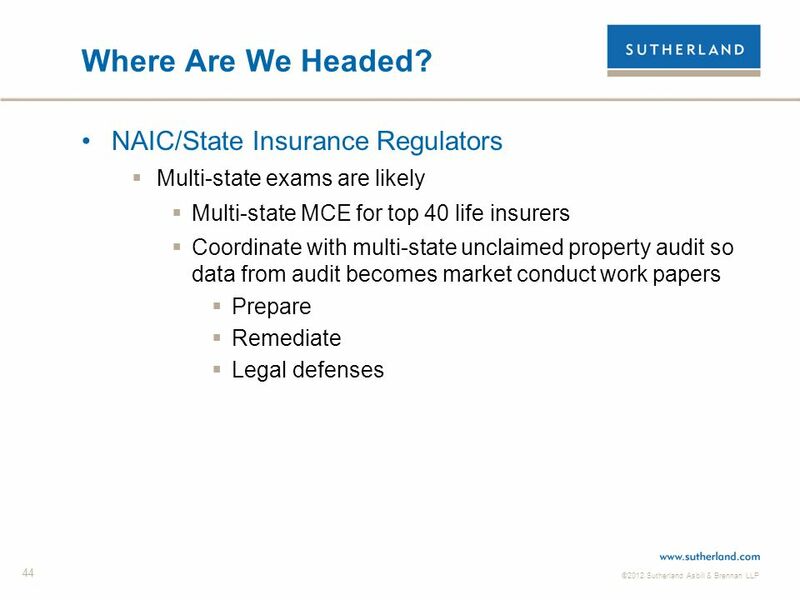 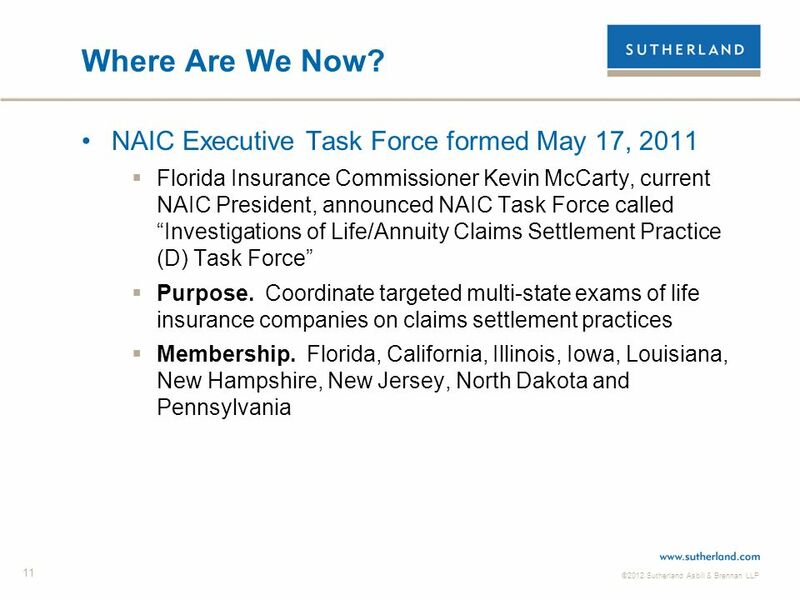 ALIC Annual Meeting: Navigating Through Uncertainty: Life Insurance Regulation and Unclaimed Property Audits Marlys A. Bergstrom Phillip E. Stano Steuart. 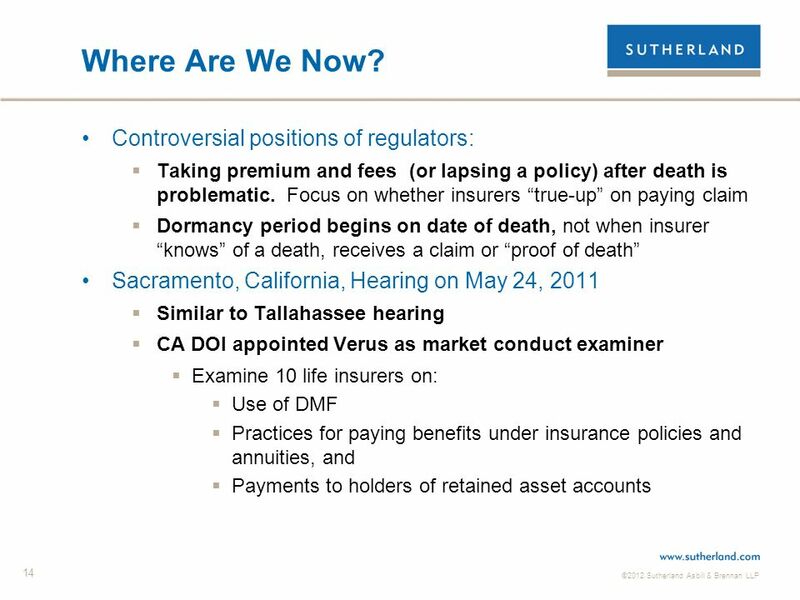 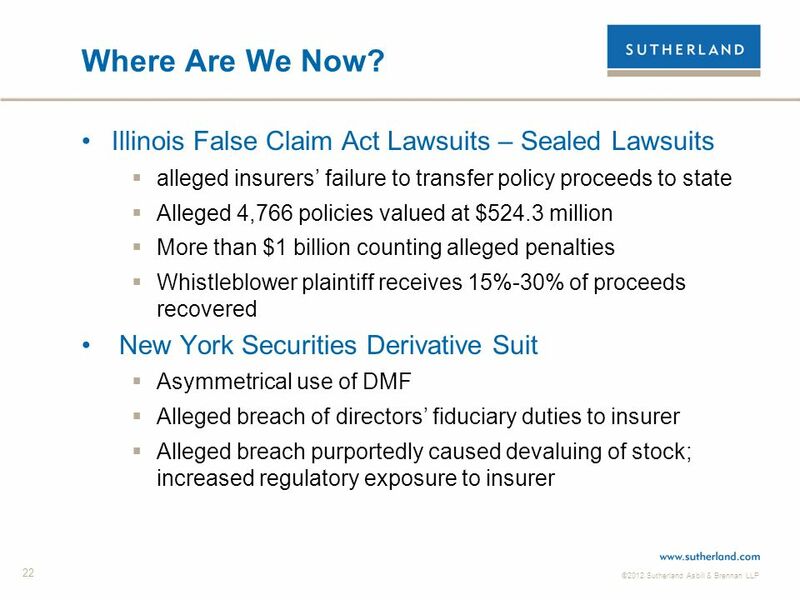 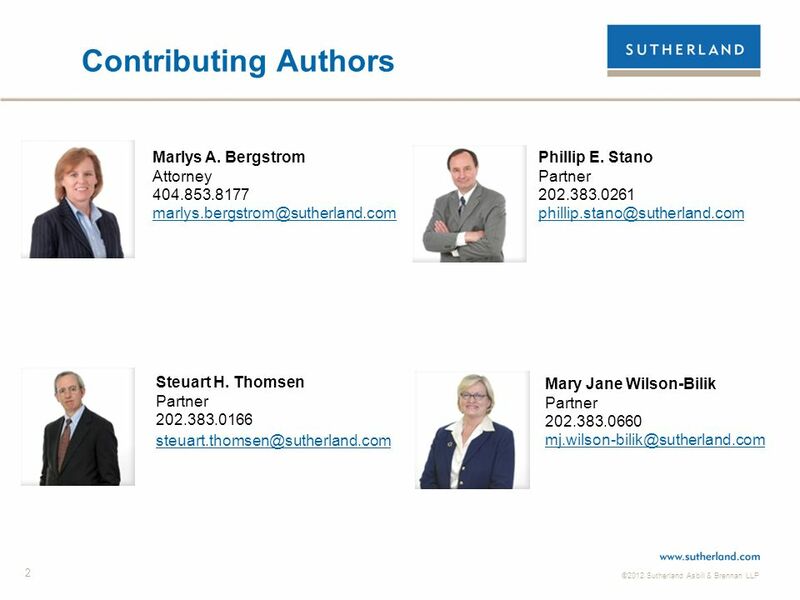 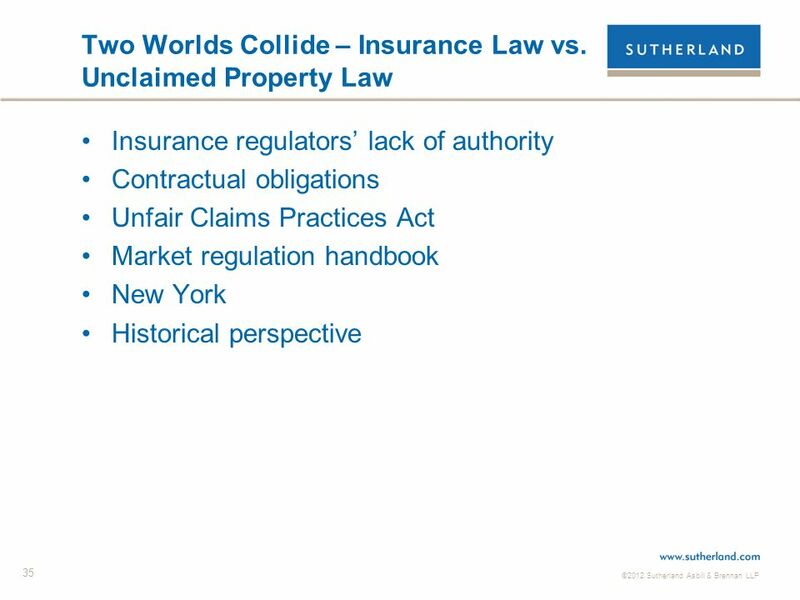 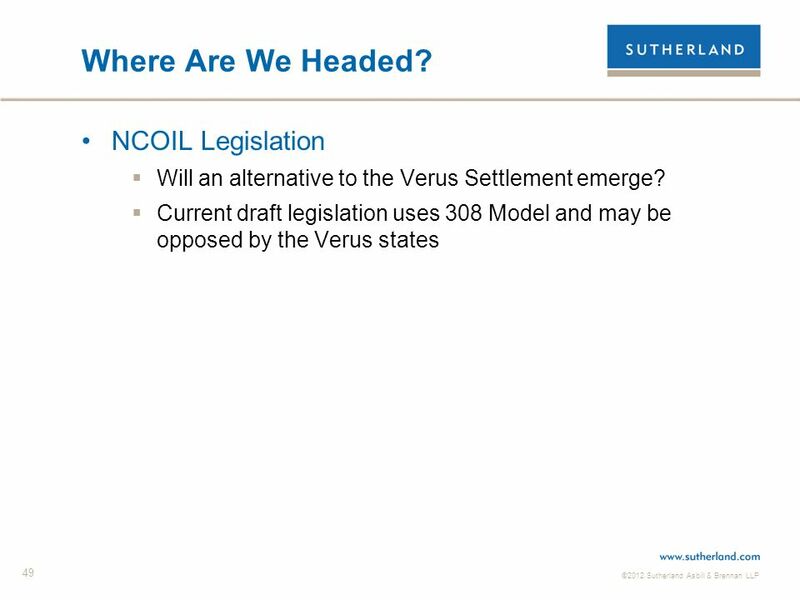 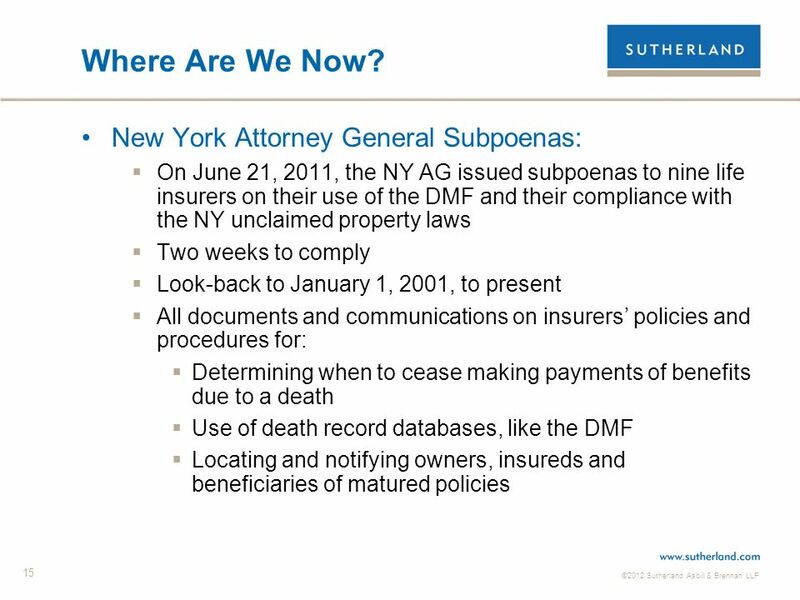 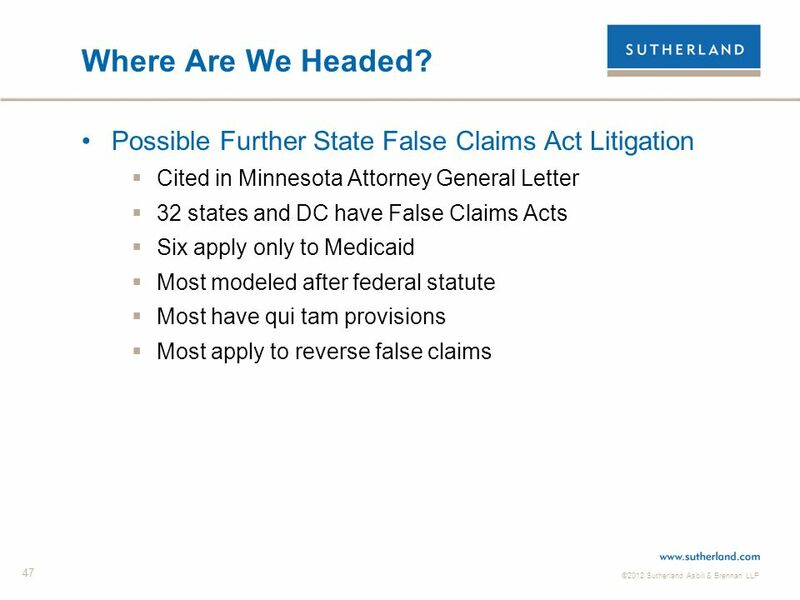 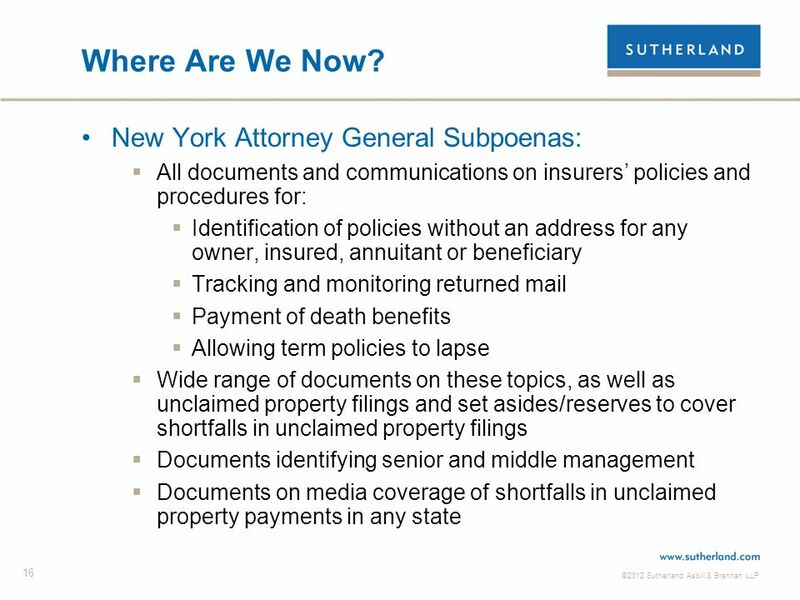 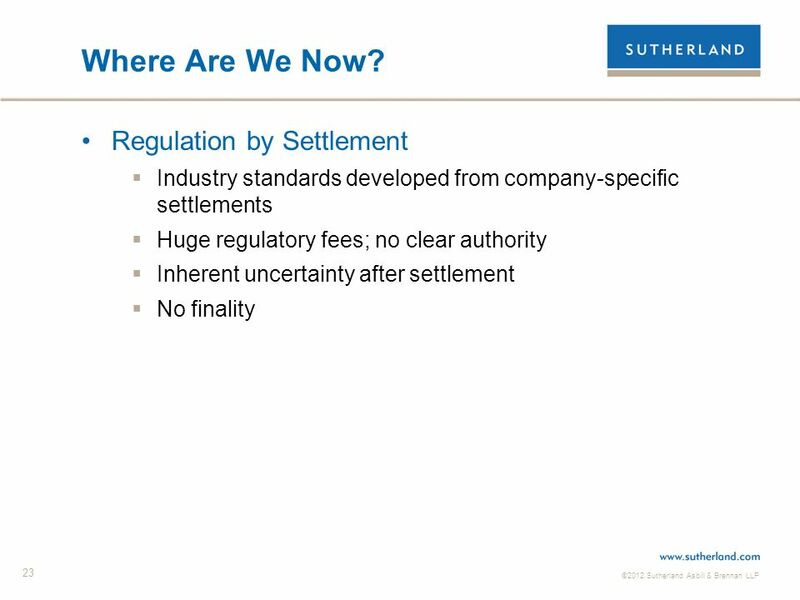 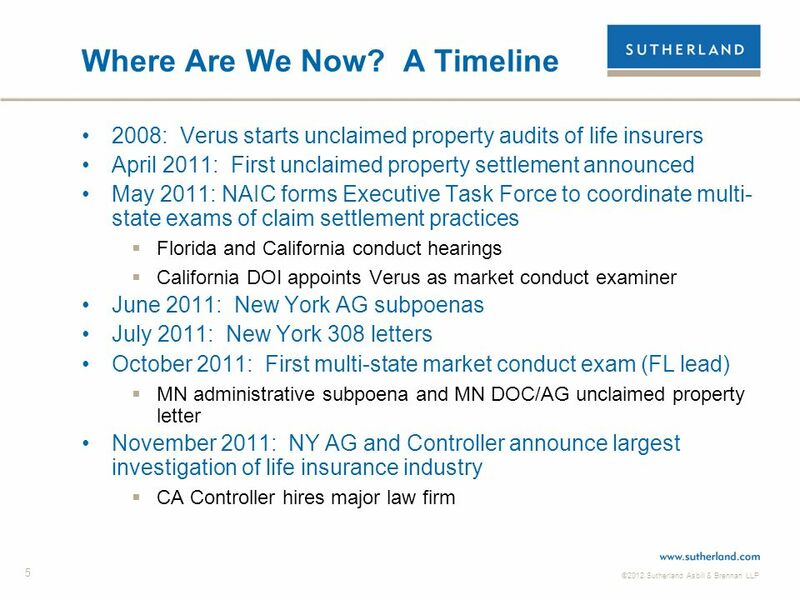 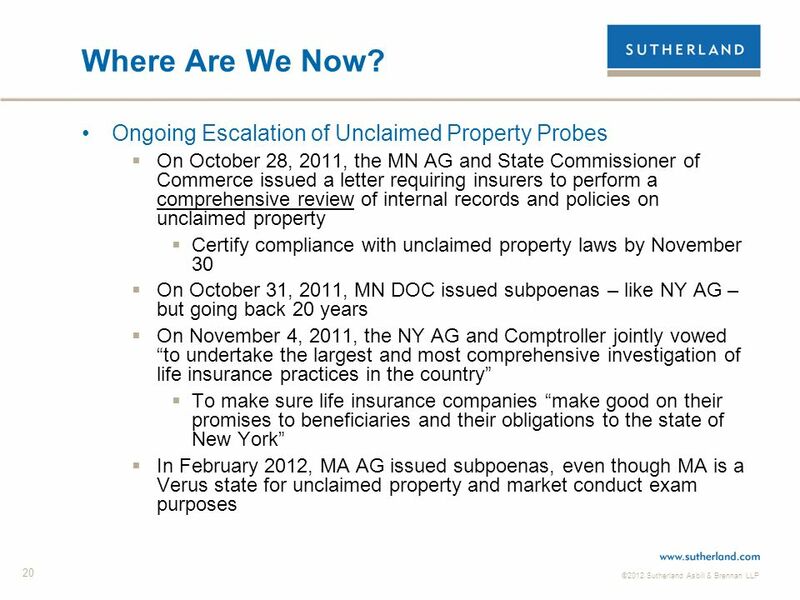 3 ©2012 Sutherland Asbill & Brennan LLP 3 Overview Where are we now? 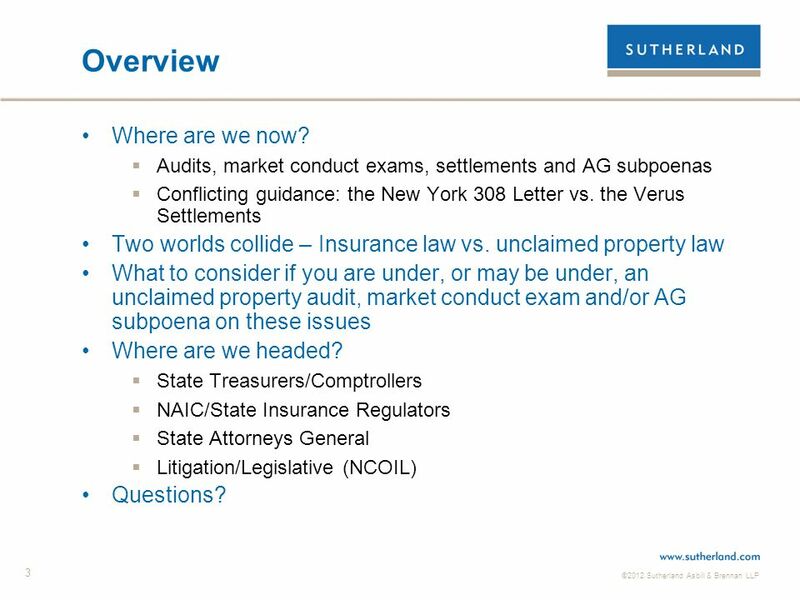 Audits, market conduct exams, settlements and AG subpoenas Conflicting guidance: the New York 308 Letter vs. the Verus Settlements Two worlds collide – Insurance law vs. unclaimed property law What to consider if you are under, or may be under, an unclaimed property audit, market conduct exam and/or AG subpoena on these issues Where are we headed? 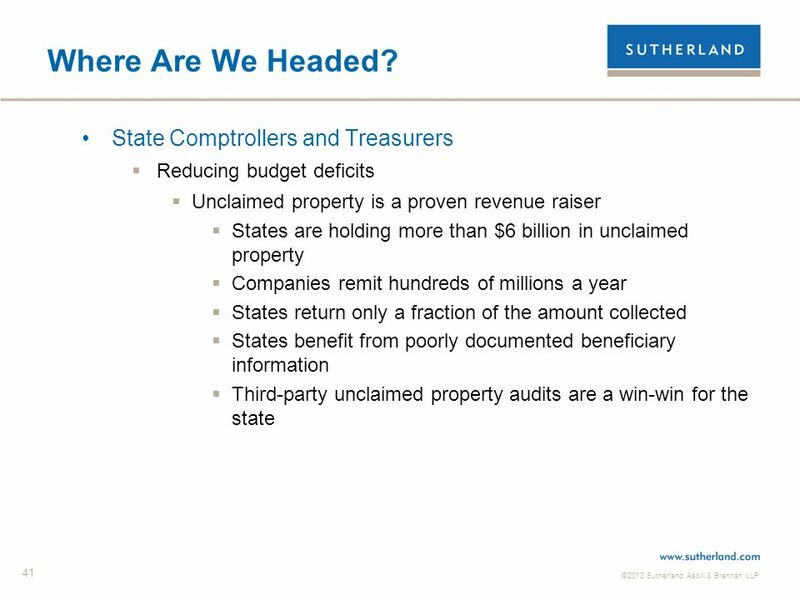 State Treasurers/Comptrollers NAIC/State Insurance Regulators State Attorneys General Litigation/Legislative (NCOIL) Questions? 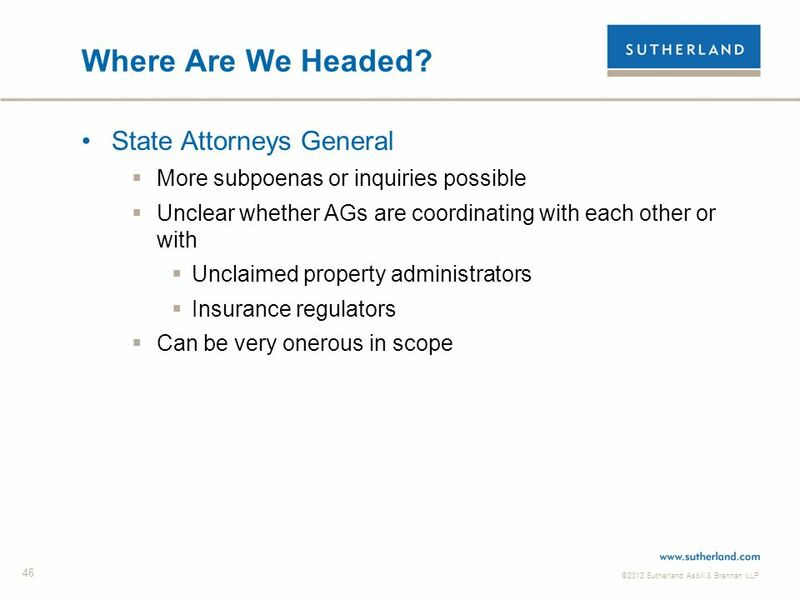 4 ©2012 Sutherland Asbill & Brennan LLP 4 WHERE ARE WE NOW? 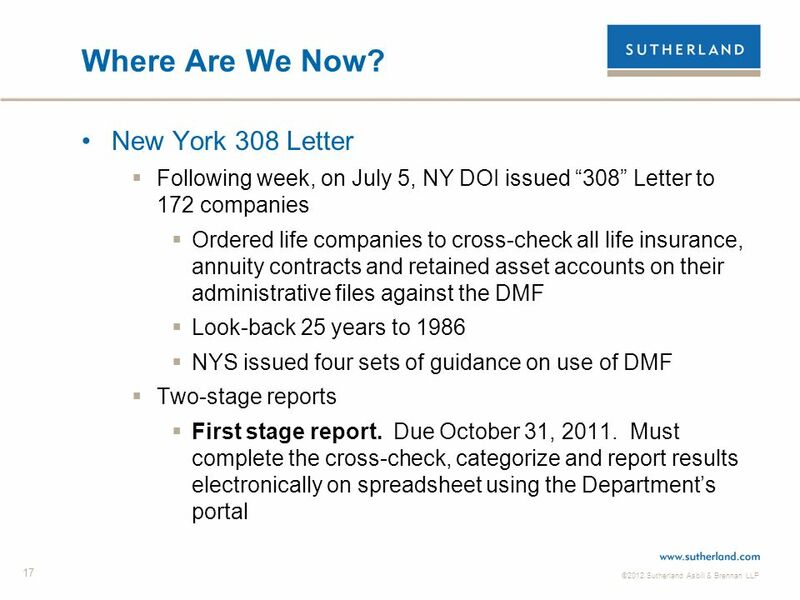 6 ©2012 Sutherland Asbill & Brennan LLP 6 Where Are We Now? 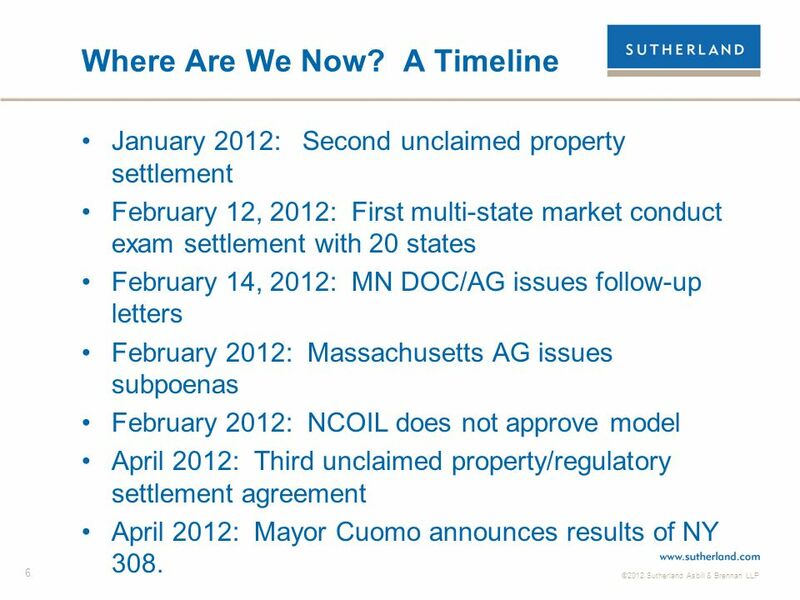 A Timeline January 2012: Second unclaimed property settlement February 12, 2012: First multi-state market conduct exam settlement with 20 states February 14, 2012: MN DOC/AG issues follow-up letters February 2012: Massachusetts AG issues subpoenas February 2012: NCOIL does not approve model April 2012: Third unclaimed property/regulatory settlement agreement April 2012: Mayor Cuomo announces results of NY 308. 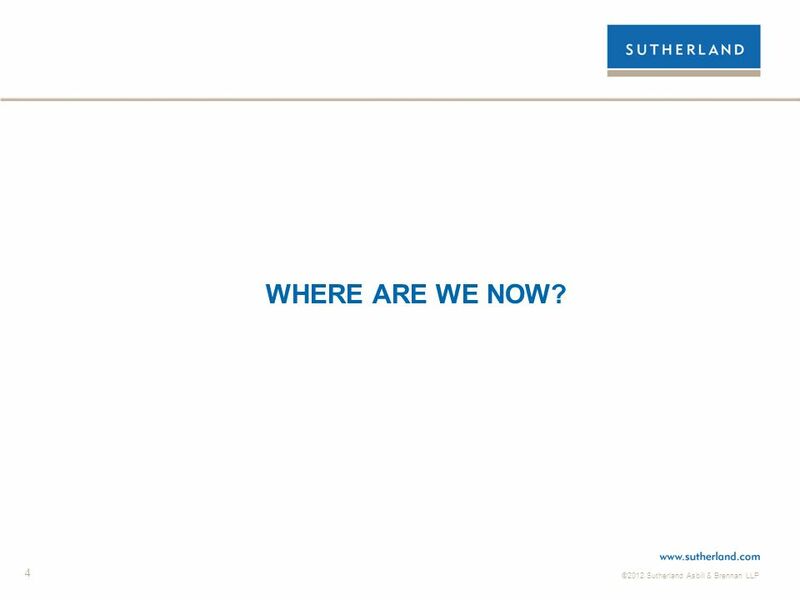 24 ©2012 Sutherland Asbill & Brennan LLP 24 Where Are We Now? 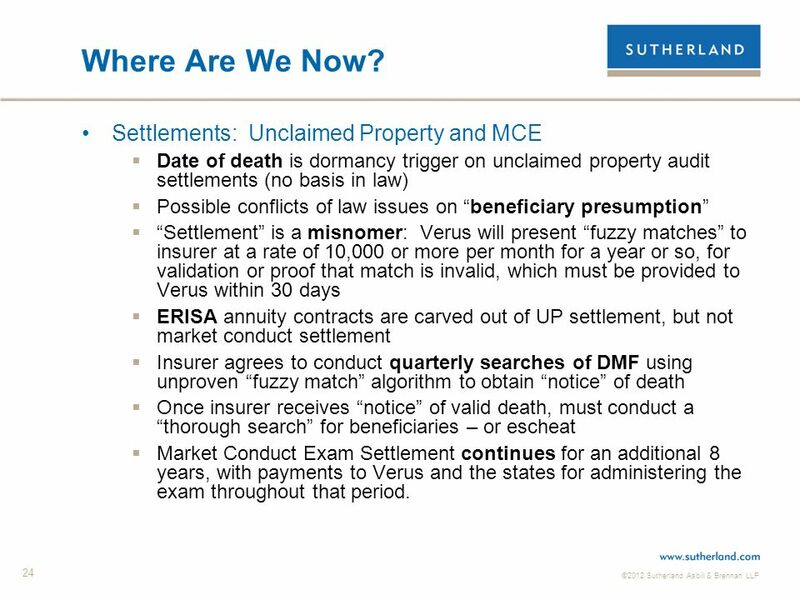 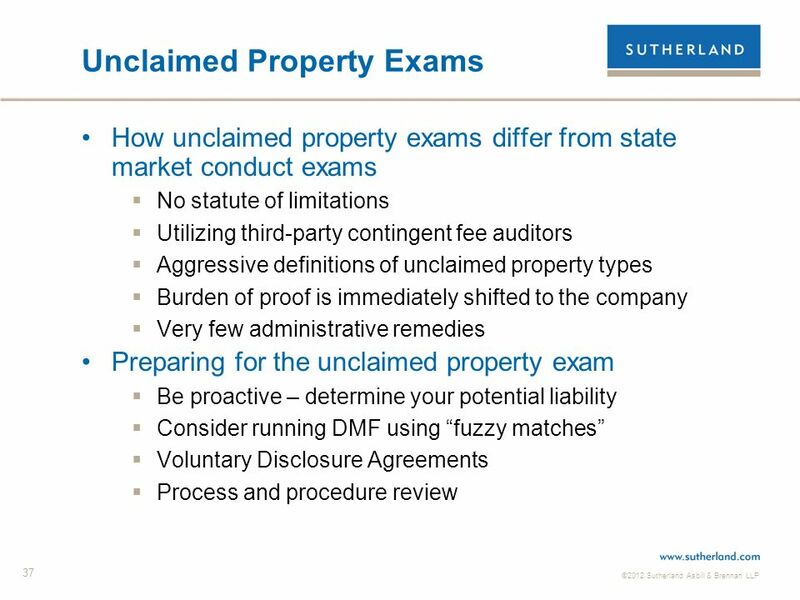 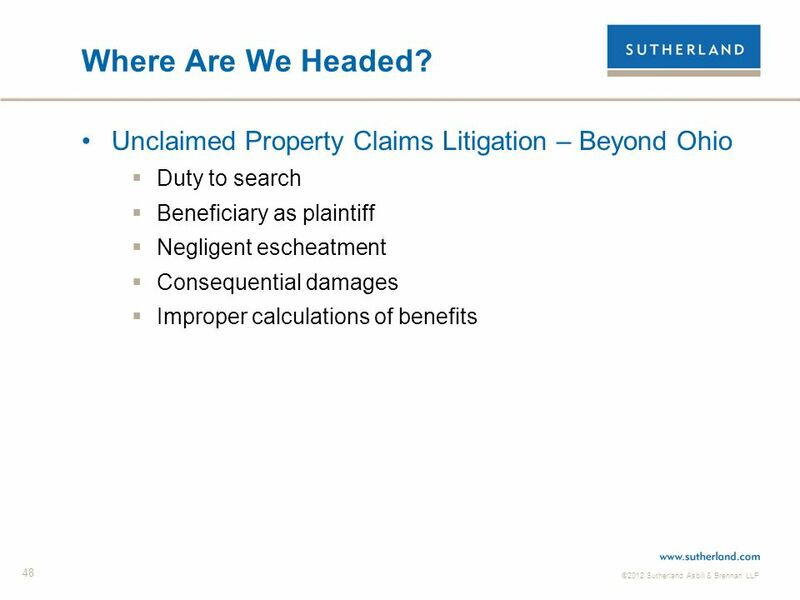 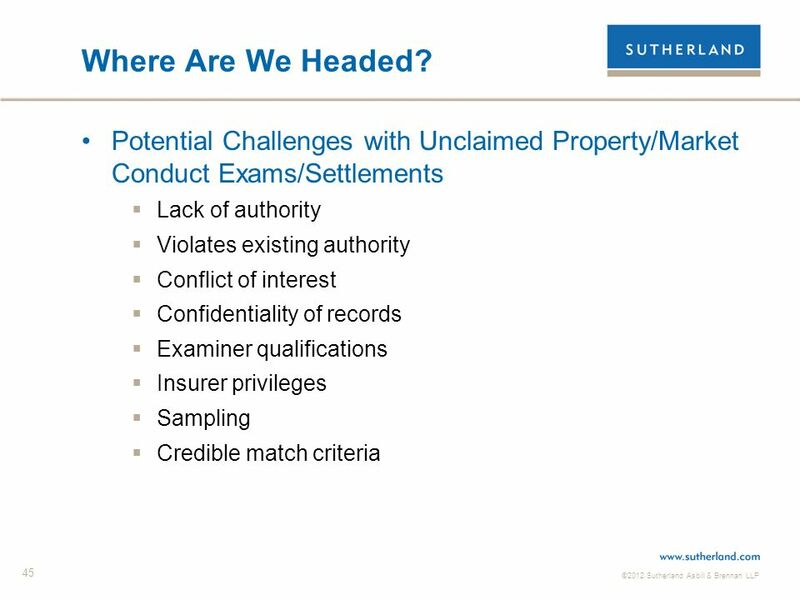 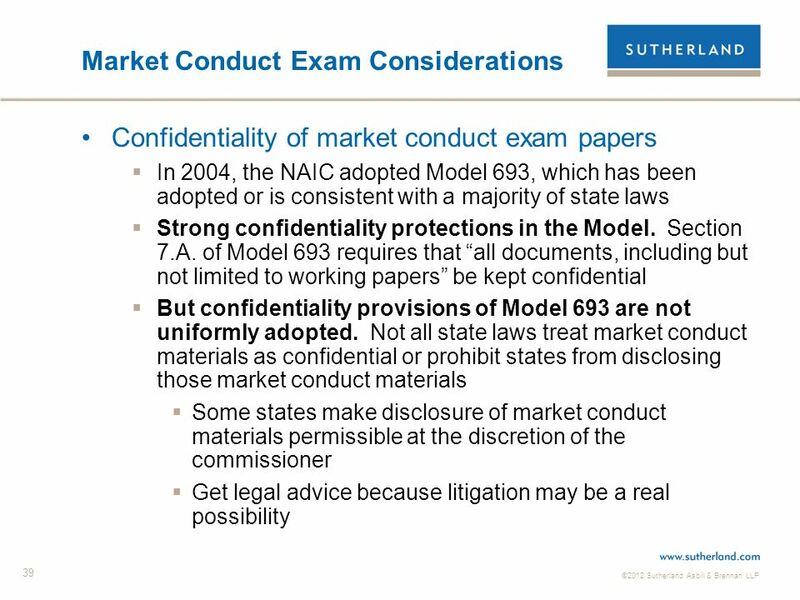 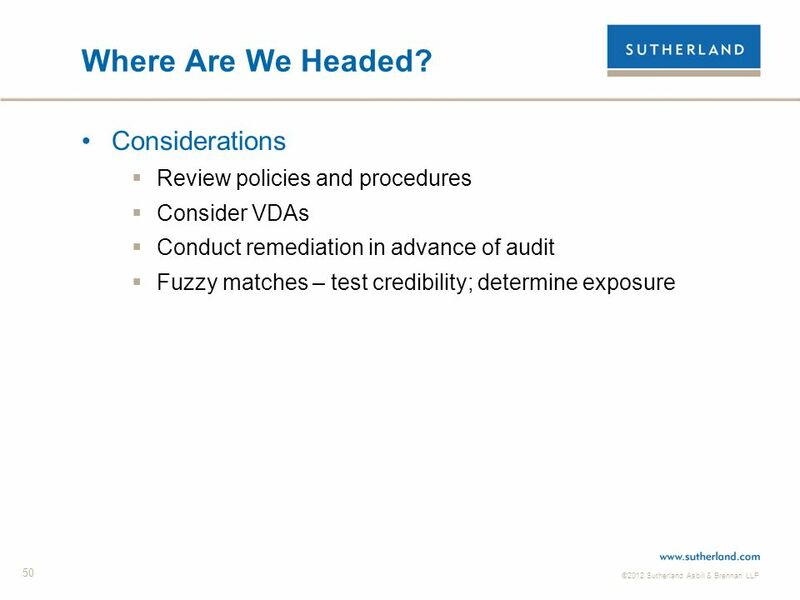 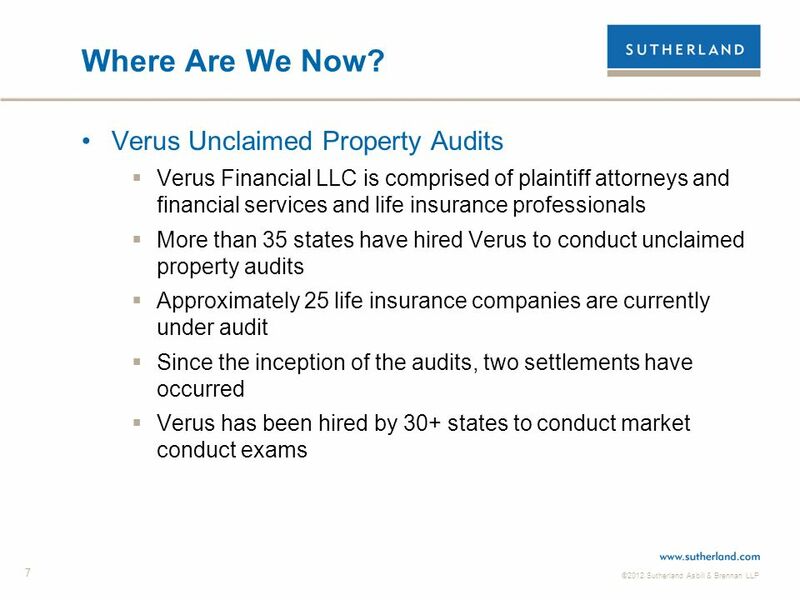 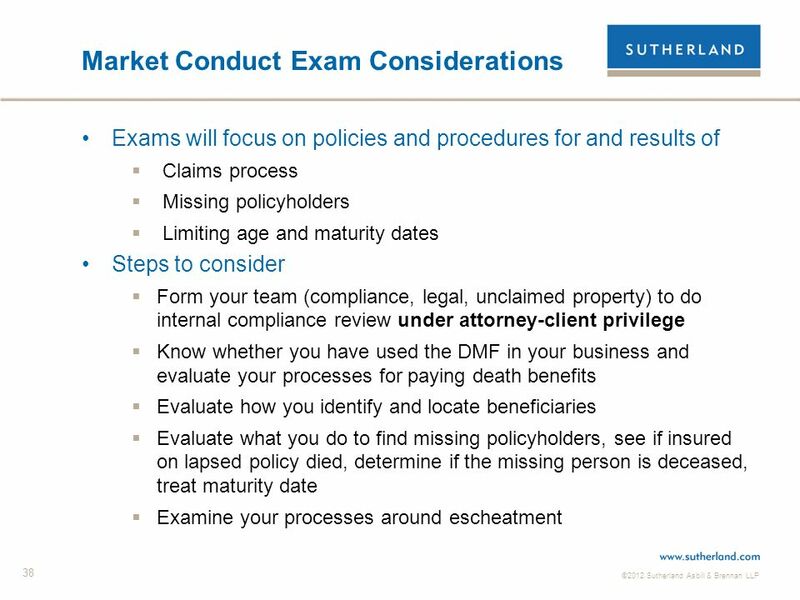 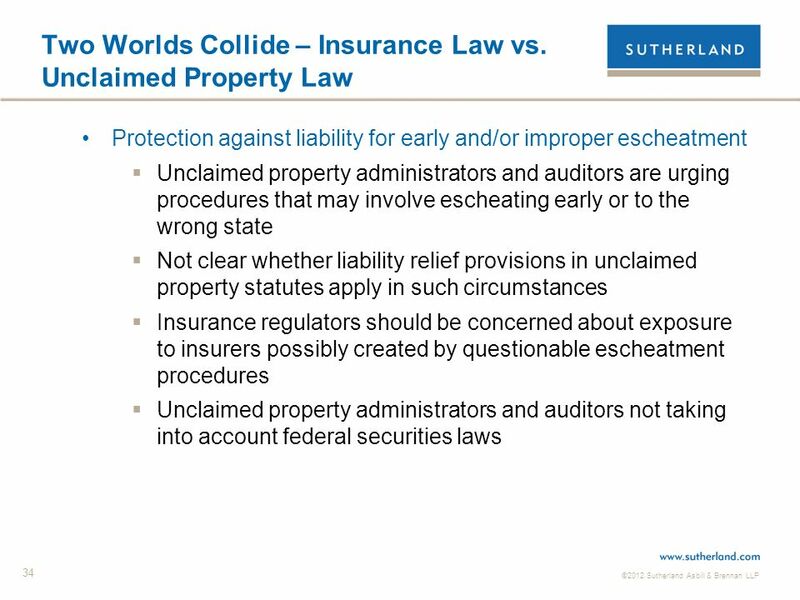 Settlements: Unclaimed Property and MCE Date of death is dormancy trigger on unclaimed property audit settlements (no basis in law) Possible conflicts of law issues on beneficiary presumption Settlement is a misnomer: Verus will present fuzzy matches to insurer at a rate of 10,000 or more per month for a year or so, for validation or proof that match is invalid, which must be provided to Verus within 30 days ERISA annuity contracts are carved out of UP settlement, but not market conduct settlement Insurer agrees to conduct quarterly searches of DMF using unproven fuzzy match algorithm to obtain notice of death Once insurer receives notice of valid death, must conduct a thorough search for beneficiaries – or escheat Market Conduct Exam Settlement continues for an additional 8 years, with payments to Verus and the states for administering the exam throughout that period. 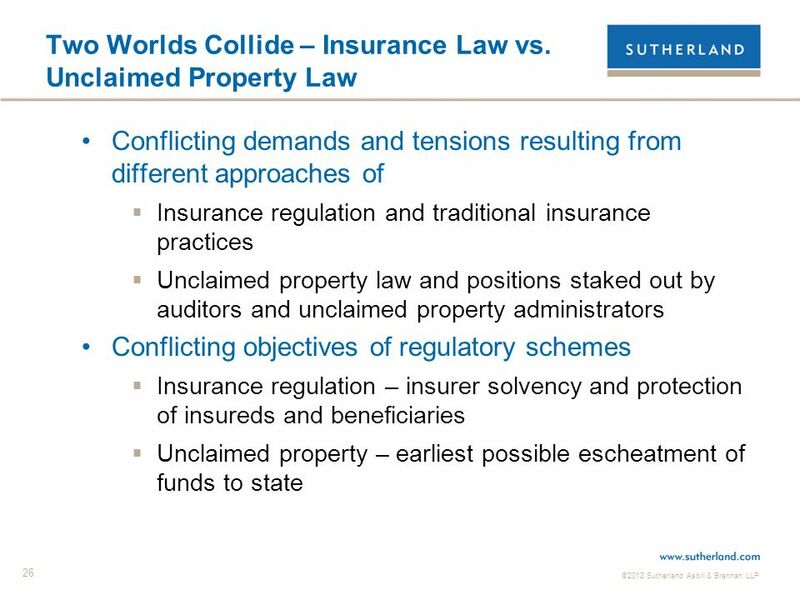 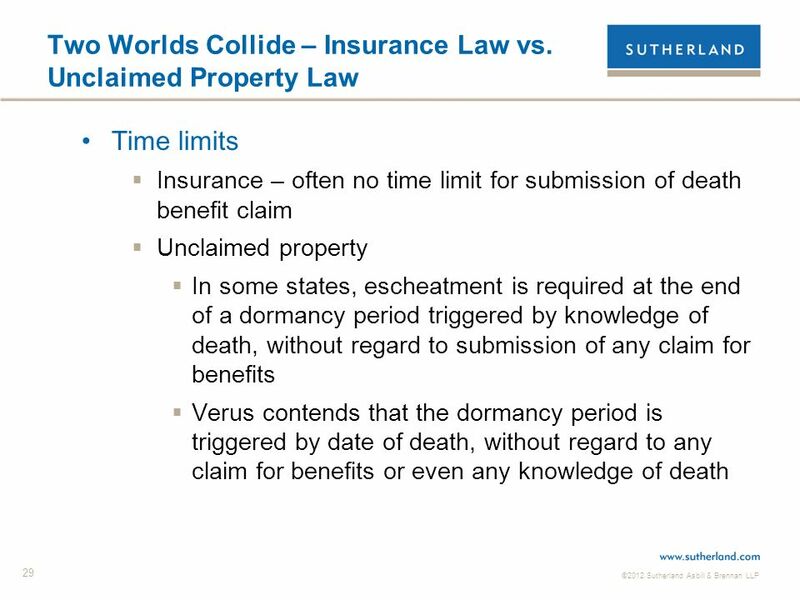 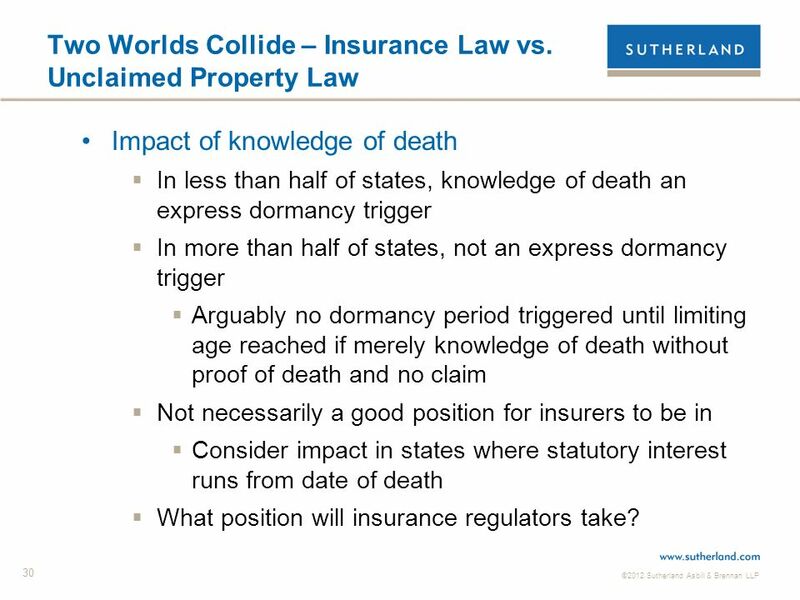 30 ©2012 Sutherland Asbill & Brennan LLP 30 Two Worlds Collide – Insurance Law vs. Unclaimed Property Law Impact of knowledge of death In less than half of states, knowledge of death an express dormancy trigger In more than half of states, not an express dormancy trigger Arguably no dormancy period triggered until limiting age reached if merely knowledge of death without proof of death and no claim Not necessarily a good position for insurers to be in Consider impact in states where statutory interest runs from date of death What position will insurance regulators take? 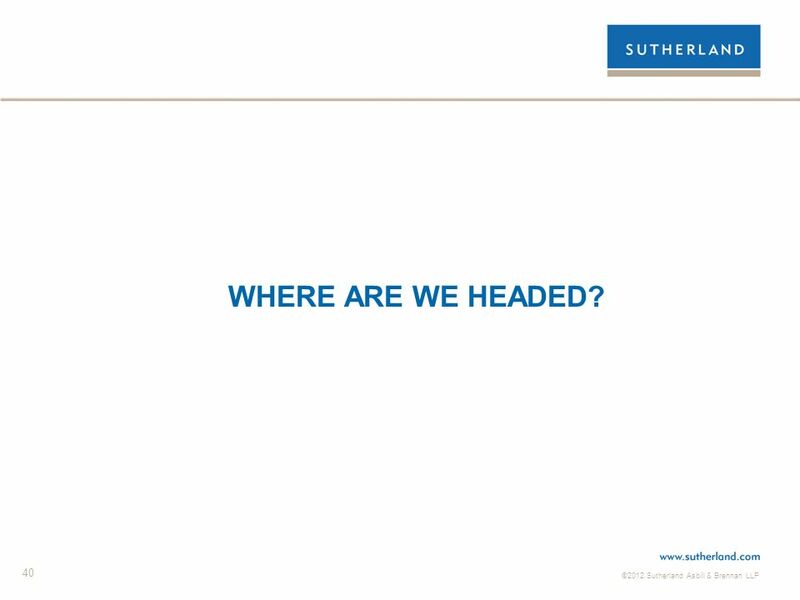 40 ©2012 Sutherland Asbill & Brennan LLP 40 WHERE ARE WE HEADED? 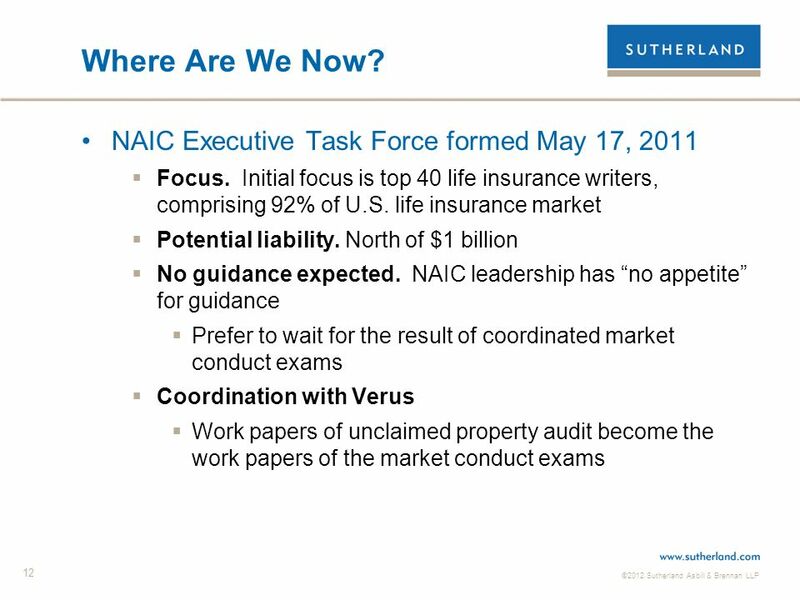 43 ©2012 Sutherland Asbill & Brennan LLP 43 Where Are We Headed? 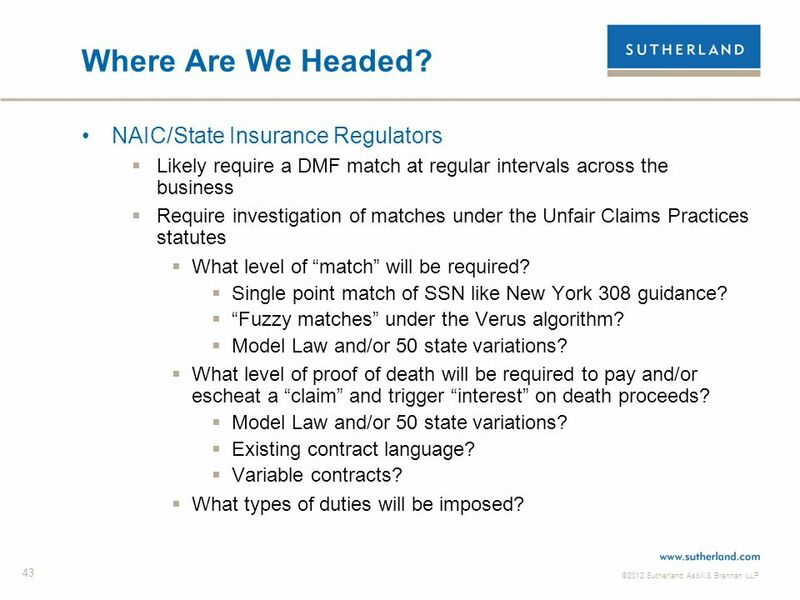 NAIC/State Insurance Regulators Likely require a DMF match at regular intervals across the business Require investigation of matches under the Unfair Claims Practices statutes What level of match will be required? 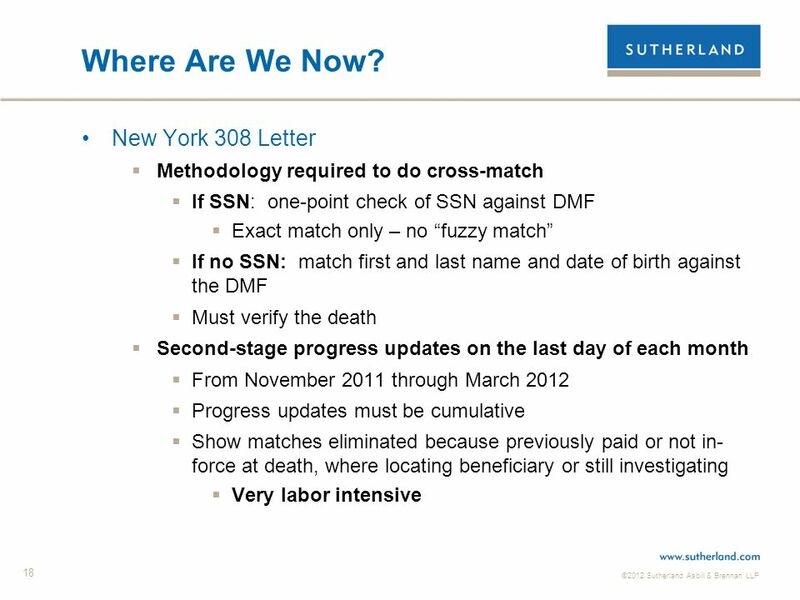 Single point match of SSN like New York 308 guidance? 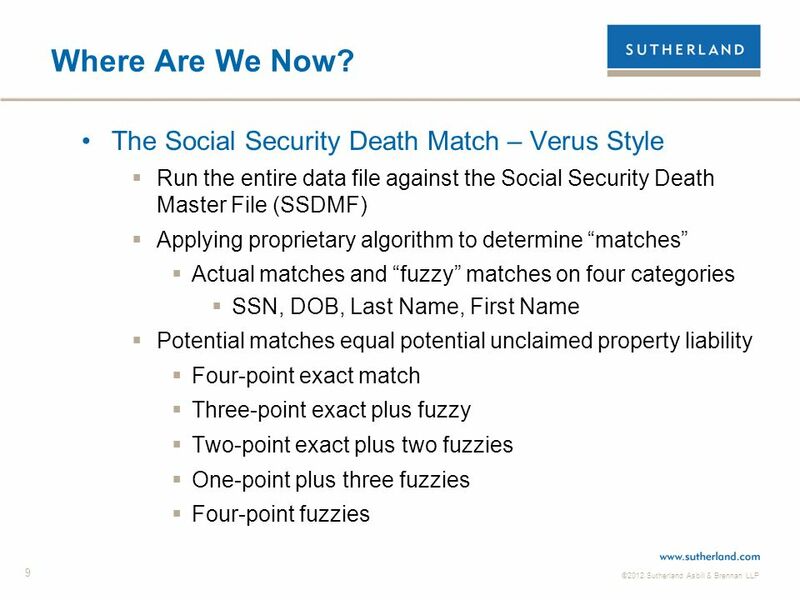 Fuzzy matches under the Verus algorithm? 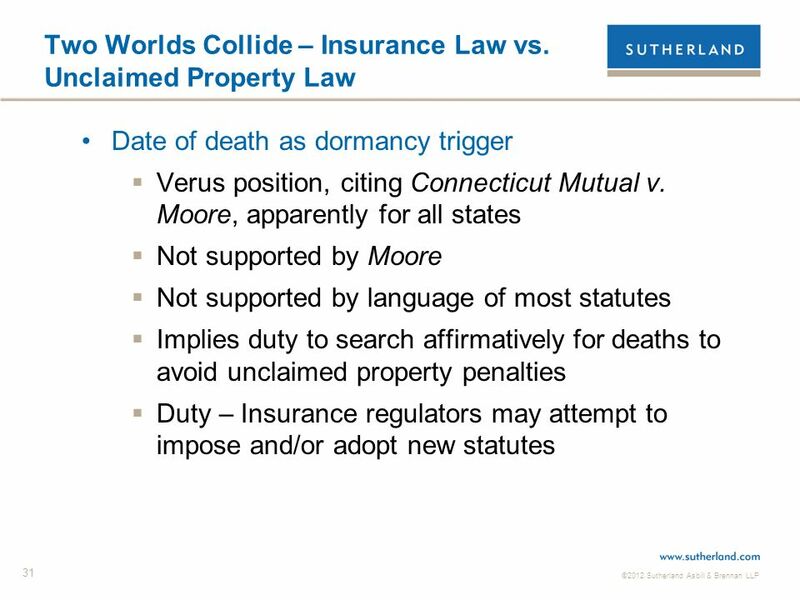 Model Law and/or 50 state variations? 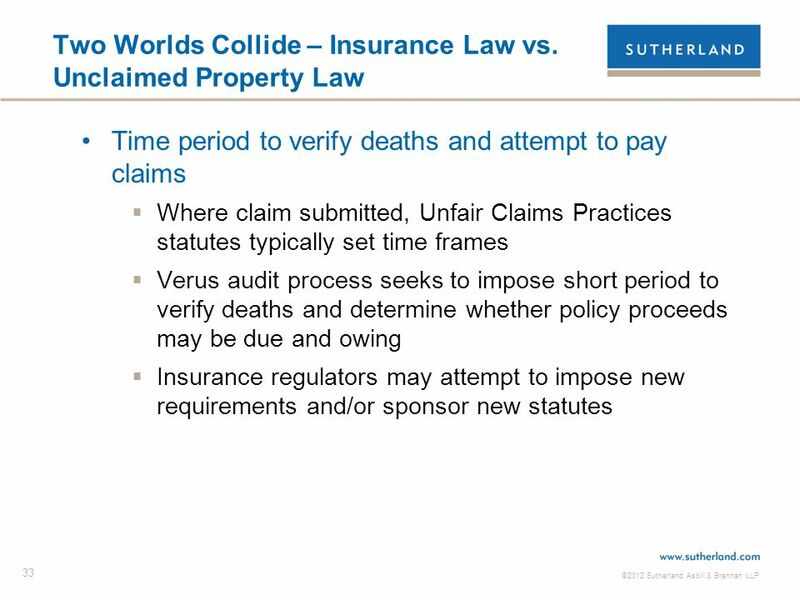 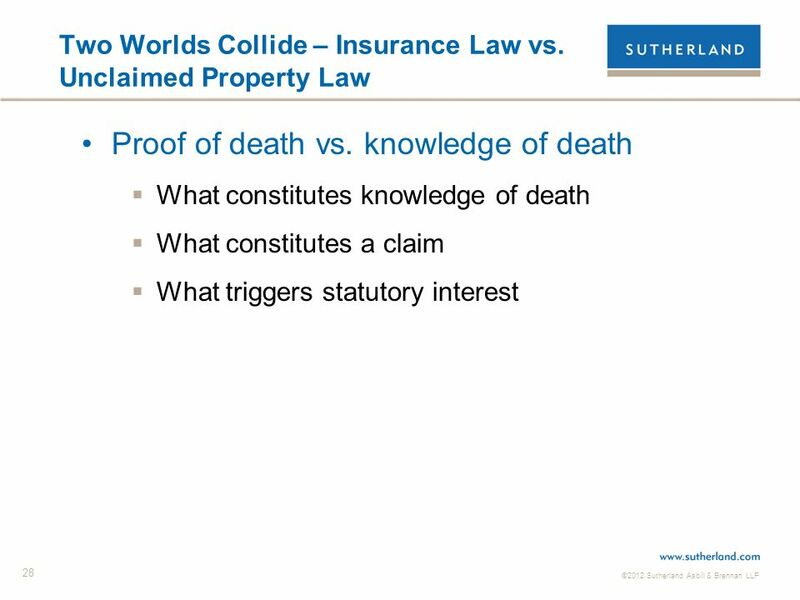 What level of proof of death will be required to pay and/or escheat a claim and trigger interest on death proceeds? 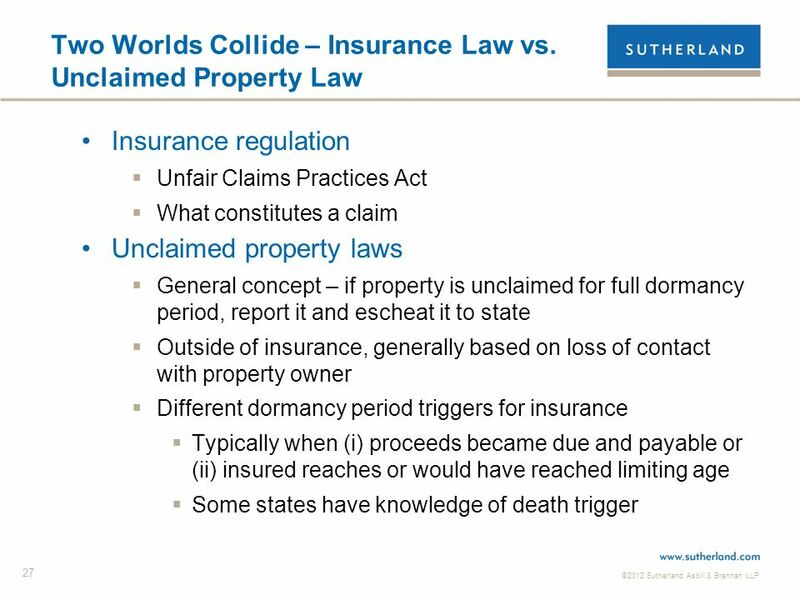 Model Law and/or 50 state variations? 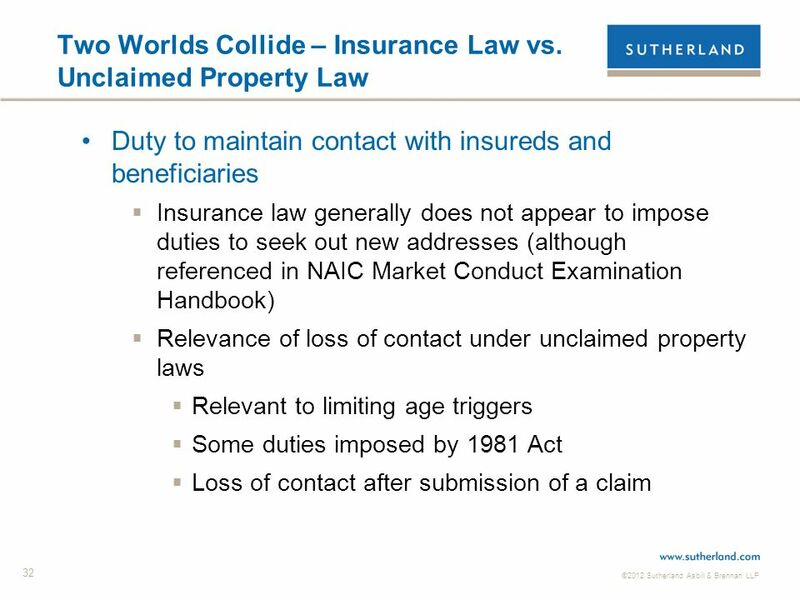 Existing contract language? 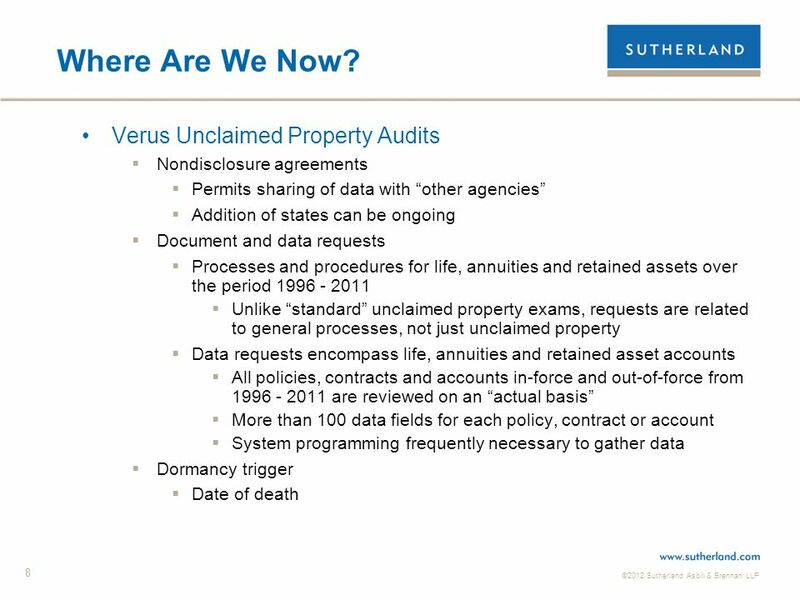 Variable contracts? 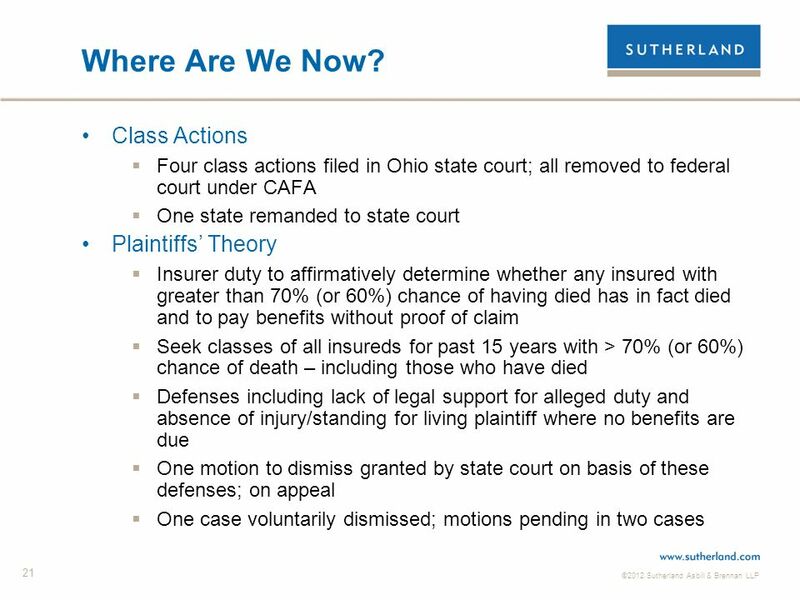 What types of duties will be imposed? 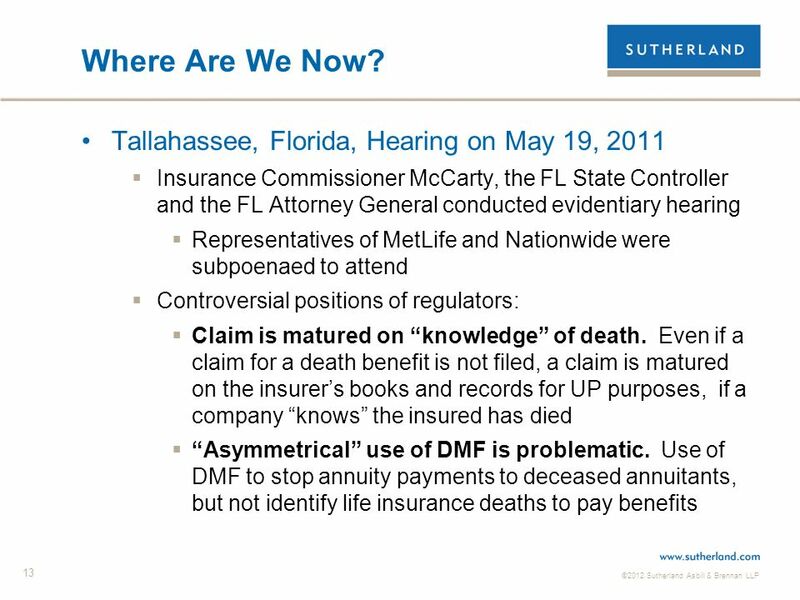 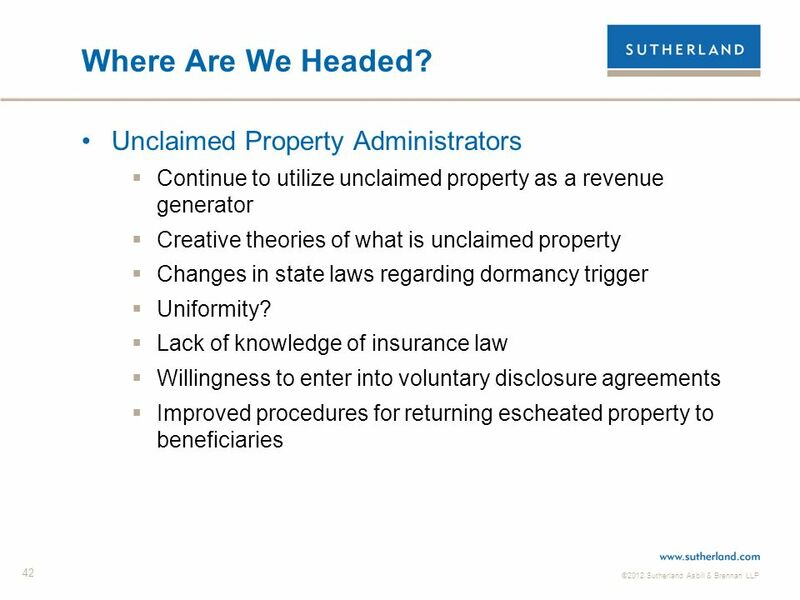 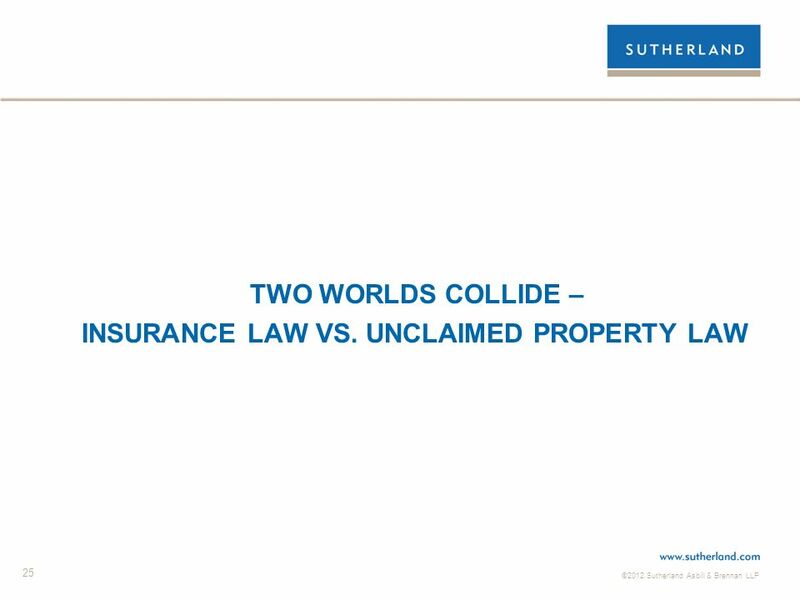 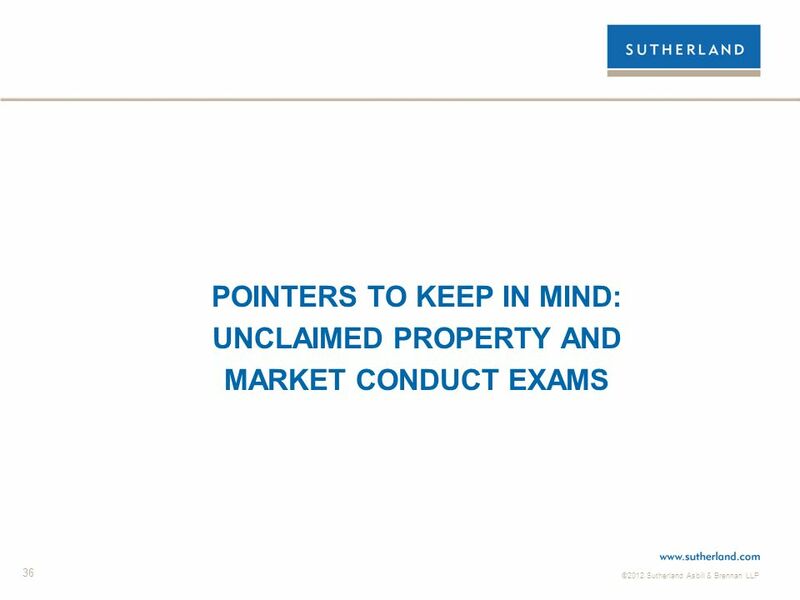 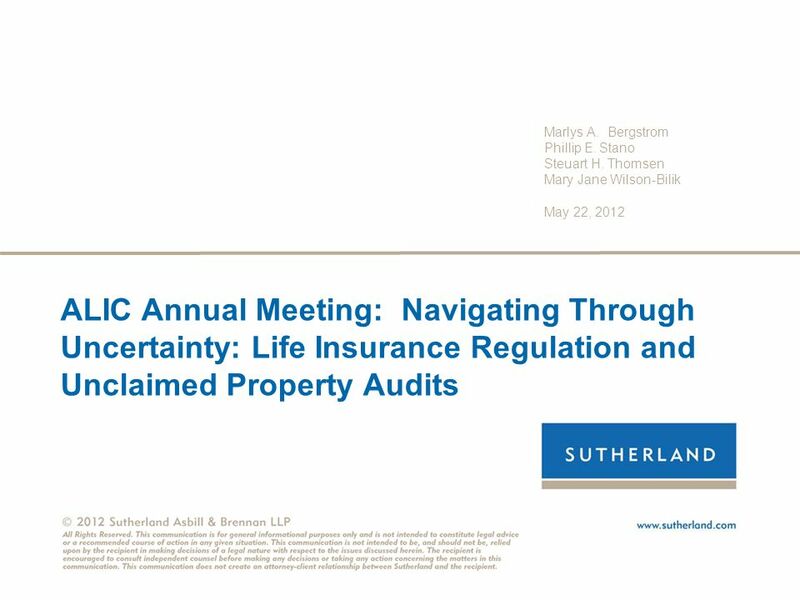 Download ppt "ALIC Annual Meeting: Navigating Through Uncertainty: Life Insurance Regulation and Unclaimed Property Audits Marlys A. Bergstrom Phillip E. Stano Steuart."